Spacecraft Falling! Get Set to Duck? 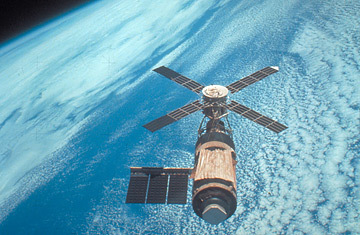 Orbiting space laboratory Skylab aloft above Earth. If you're the kind inclined to worry, here's a real hand-wringer for you: Sometime as early as February, 7,000 lbs. of flaming metal are going to start raining out of the sky, and nobody can say exactly where on Earth it's going to happen. The upside is, there's almost no rational reason you should give it a second thought. The approaching fireball of debris comes to us courtesy of an unnamed U.S. spy satellite launched in December 2006, which reached orbit perfectly well, but then suffered a breakdown that caused ground controllers to lose communication with it. "It's not necessarily dead, but it's deaf," John McDowell, an astronomer with the Harvard-Smithsonian Center for Astrophysics unhelpfully told The New York Times. A deaf satellite, after all, is almost as bad as a dead satellite, when it comes to telling it to fire its thrusters so that it can stay in orbit, or at least come down in a safe place like the middle of the ocean. Without communications, the satellite becomes a falling cannonball colliding with the atmosphere at 17,500 mph. That very atmosphere, however, helps ensure that we're in very little danger from being struck by this craft or any other incoming junk. Even billions of years after the formation of the solar system, space is still something of a shooting gallery, with meteors careening everywhere. The Earth is a very fat, very slow target for such flying rubble, but the high speed of the approaching rocks and the density of the planet's air cause anything but the biggest pieces of debris to burn up on their way down, producing nothing more dangerous than shooting stars. That's not to say we're at zero risk from space junk. In the 50 years since the launch of Sputnik, the world's first satellite, and Explorer I, America's first satellite, rocket builders from all over the world have fired so much heavy hardware into space that the planet is now surrounded by a belt of litter consisting of some 10,000 objects four inches or more in diameter and many tens of thousands of smaller ones. Taken together, they're estimated to represent more than 900,000 lbs. of flying  and possibly falling  rubbish. In 2006, wreckage from a plummeting Russian spy satellite whizzed dangerously close to a Latin American Airbus carrying 270 passengers. That near-miss took place over the Pacific Ocean, which is considered among the safest places in the world to bring down satellites due to its unpopulated vastness. The worst uncontrolled reentry in history occurred in July 1979, when Skylab, America's abandoned, 78-ton space station  which had long since run out of maneuvering fuel  came down earlier than planned, raining debris across the Australian outback. Often, however, satellites and other spacecraft are brought down in a much more controlled way, their trajectories tweaked and adjusted before their terminal plunge so that they strike a precisely selected  and safely empty  spot. In 2000, the 17-ton Compton Gamma Ray Observatory was gently steered back to earth this way. In 1970, one of the most storied spacecraft of all  the Apollo 13 lunar module, which served as a lifeboat for the crew when their command module was crippled by an explosion  sparked fears of nuclear contamination since it was on a return path to collide with Earth still carrying radioactive instruments that were supposed to have been left on the surface of the moon. As reentry approached and the astronauts clambered back into the command module through the tunnel that linked the two ships, the soon-to-be-jettisoned lunar module was already being targeted for a landing in a deep ocean trench off the coast of New Zealand. There it splashed down and sank  and there it remains. The comparatively small spy satellite now wobbling its way home will not have nearly so precise a landing  but it is likely to have an equally uneventful one. Seventy percent of the Earth's surface is water, meaning that there ought to be a 7 in 10 chance that the craft will drop in the drink. The fact that satellites are usually targeted for flight over land narrows those odds some, but the equally important fact that the majority of the Earthly land mass is uninhabited widens them back up. That plus the small size of the doomed craft probably means its death will be nothing more than a pleasant sky show for the few people lucky enough to see it. If you're the kind inclined to worry, you might have to pick another problem. The original version of this story incorrectly stated that the U.S. spy satellite expected to fall back to Earth weighs 20,000 lbs. It weighs 7,000 lbs.